Norway's first king, Harald I -- also known as Harald Fairhair -- was born in the ninth century. His father, Halfdan the Black, ruler of Vestfold in southeast Norway, was descended from Sweden's royal Yngling family. When Harald was 10, his father died and Harald succeeded him as king. Before he reached his mid-20s, Harald had defeated rival kings in battle and united Norway under his rule. After the death of King Haakon V in 1319, the Norwegian crown passed to his grandson Magnus, who was also king of Sweden. In 1397, Denmark, Norway, and Sweden formed the Kalmar Union under Margaret I, a Danish princess who had married King Magnus's son Haakon VI. Although her relative Eric of Pomerania was the official king, it was Margaret who ruled until her death in 1412. Sweden elected its own king in 1523, but Norway remained united with Denmark until 1814, when Denmark ceded Norway to Sweden. In 1905, Norway became independent from Sweden. Its new government offered the crown to Prince Carl, second son of Denmark's future King Frederick VIII. After being approved in a popular vote by the Norwegian people, the prince ascended the throne as King Haakon VII. Norway remained neutral in the First World War. It was invaded by Germany during World War II. Haakon VII fled to England, where he remained in exile for exactly five years. 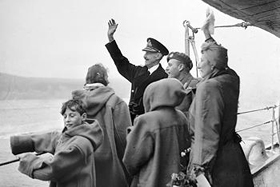 He received a warm welcome when he returned to Norway in 1945. King Haakon died in 1957 and was succeeded by his son Olav V. King Olav died in 1991; the present king is his son, Harald V. Norway is a constitutional monarchy; the king does not rule, but represents the country and plays a ceremonial role. King Harald and his wife, Queen Sonja, have two children, Princess Märtha Louise (born in 1971) and Crown Prince Haakon (born in 1973). The crown prince married Mette-Marit Tjessem Høiby in 2001. Their first child, Ingrid Alexandra, was born on January 21, 2004. Their second child, a son named Sverre Magnus, was born on December 3, 2005. Crown Princess Mette-Marit also has a son named Marius Borg Høiby from a previous relationship. Princess Märtha Louise married writer Ari Behn in 2002. Their first child, Maud Angelica Behn, was born in 2003. Their second child, Leah Isadora Behn, was born in 2005. Early Kings of Norway by Thomas Carlyle. This classic book tells the stories of Harald Haarfagr, Eric Blood-Axe, and other early kings. Unpredictability and Presence: Norwegian Kingship in the High Middle Ages by Hans Jacob Orning. In the 12th century, the king, under strong clerical influence, was depicted as just and omnipresent, but he based his dominion on unpredictability and presence. The Royal House of Norway by Morten Ole Morch. About the Norwegian royal family from 1929, when Crown Prince Olav married Sweden's Princess Martha, until her death in 1954. Includes newspaper articles, diary entries, and more than 500 illustrations. A Short History of Norway by T. K. Derry. The Psalter of Christina of Norway in the Collection of the Royal Library, Copenhagen by Marina Vidas. The first detailed analysis of an exquisitely illuminated 13th century Parisian manuscript which was owned by Christina of Norway (1234-1262), daughter of Haakon IV and wife of Philip of Castile and Leon. Style & Splendour: The Wardrobe of Queen Maud of Norway 1896-1938 by Anne Kjellberg and Susan North. Queen Maud was one of the best-dressed women of her age. Using photographs of her clothes and accessories, this book shows the evolution of women's fashion from the 1890s to the 1930s. Morkinskinna: The Earliest Icelandic Chronicle of the Norwegian Kings (1030-1157), translated by Theodore M. Andersson and Kari Ellen Gade. Written around 1220, this is an account of the early kings of Norway. Heimskringla, or the Lives of the Norse Kings by Snorri Sturlason. A 13th century history of the kings of Norway, from prehistoric times to 1177. King Harald's Saga by Snorri Sturlason, translated by Magnus Magnusson and Paulsson Herman. This is part of the Heimskringla. It records the life of King Harald Hardradi of Norway, who served and fought in every corner of Europe, from Russia to Sicily, but was defeated by King Harold of England three weeks before the Battle of Hastings. QSPA 5 by HM Queen Sonja, Magne Furuholmen, and Lars Saabye Christensen. An avid printmaker, Queen Sonja of Norway, wife of King Harald V, collaborated with Magne Furuholmen (formerly of a-ha) to create colorful graphic design works. The proceeds from this volume contribute to the Queen Sonja Print Award. The Spiritual Password: Enter Your New World of Bliss by Princess Märtha Louise and Elizabeth Nordeng. A guide to meditation techniques. Princess Martha Louise is the daughter of Norway's King Harald V.
Trist Som Faen (Sad as Hell) by Ari Behn. A collection of short stories. The author was married to Norway's Princess Martha Louise. Why Kings and Queens Don't Wear Crowns by Princess Martha Louise. A fictional story for children ages 4 to 8. The author is the daughter of the current king of Norway.